We just got this great note from Brennen Elementary School who jumped in with both feet again this year to help build a well in Kenya. We’re so thankful for committed teams like Brennen. Without them, we couldn’t do any of this. Their students gave up snacks, lunch money, allowance, even a tooth, so they could give it away and help give clean, safe water. We had a great time. 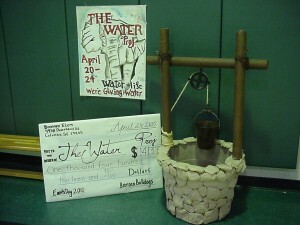 We held our Water Project in conjunction with Earth Day this year. We were one of the stations that the children rotated to. Usually the PTO buys Popsicles for all the children at Earth day, but again this year the children all AGREED to forgo the small treat and have tap water. 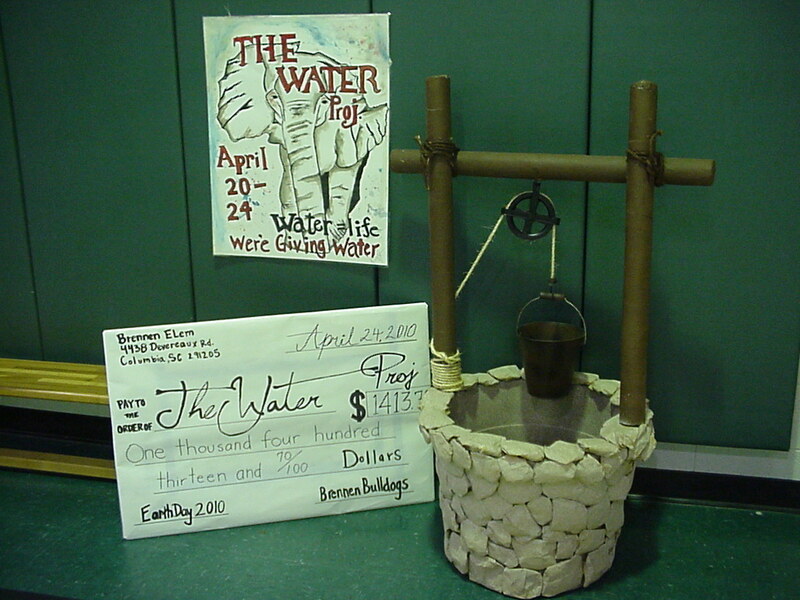 At our station they had water and put the money their class had collected into the “well” that we made. 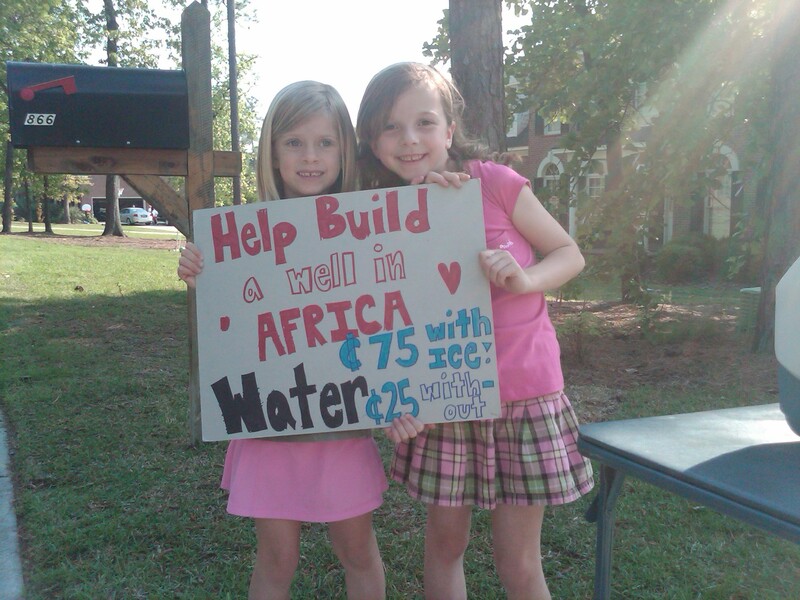 The PTO then graciously agreed to write the check instead to the Water Project. They gave us $200.00. In that way EVERY child at the school participated in giving up something for the well. We also put a “bank” one of the children made at the lunch counter. Two days a week the children are allowed to buy cookies or ice cream in addition to their lunch. Many of them chose to put their money in the box and forgo the treat. Others, put the change they received. We had one child who on the last day was excited to put in his “tooth fairy money”. I asked him if he had pulled the tooth so he could get the money. He said. “no, my friend had kicked it out while we were wrestling!” 🙂 We had several groups of friends make lemonade stands and water stands in their neighborhoods. This was their idea. 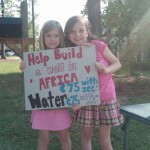 I’ve attached a pic of 2 first graders that one of the parents sent. Several families were very supportive and all gave up everything except tap water for the duration of the project. We had several children empty their piggy banks. They loved our Water Project T-shirts. Susan (other sponsoring teacher) and I wore them every day!! We told them we were saving water on laundry!! 🙂 We have one child who is saving his allowance for several weeks so he can get one! Incredibly, the featured article in the 5th grade “Weekly Reader” for Fri. Apr. 23 (day we collected the money) was “Water Woes” and stated many of the same facts that I shared with the children to explain the project. It had several pics of children carrying water….and explained the magnitude of the problem. We used it to reinforce what we had told the children. I’m sure you hear these kinds of “stories” every day but we wanted you to know that you are not only helping children without clean water, you are also helping to educate the minds and hearts of our children who are blessed with much. Thank you for the bracelets. The children like them a lot. You are wonderful to work with. Hopefully, we’ll be allowed to do this next year too!! The children are looking forward to SEEING where they help to build a well!! Me too! !